A steak year or a hamburger year? Long ago, when I was stupid enough to be a newspaper editor, we would gauge the profitability of the newspaper year by whether it was a steak year or a hamburger year. In steak years, we would go on expensive retreats to posh resorts and take job candidates to what we called “expense account” restaurants, meaning you could only afford to go there on an expense account (see The Palm). In hamburger years, the expense account would get you to Five Guys for a hamburger (actually the burgers were tastier than much of the Palm’s menu). I would say that we are definitely in a hamburger year. Hamburger Helper will be 2009. Which brings me to the cover of Saveur, one of the great food magazines of this or any other era. Its December cover features “Everything You Need to Know about Filet Mignon.” Like the first thing you’d need to know is that nobody can afford it right now. When the editors of Saveur were putting this issue together gas was more than $4 a gallon and homes were being foreclosed on right and left. Maybe they looked in the crystal ball and thought times would be better by Christmas. Not so much. But here’s the good news. Check out my little buddy to the left. 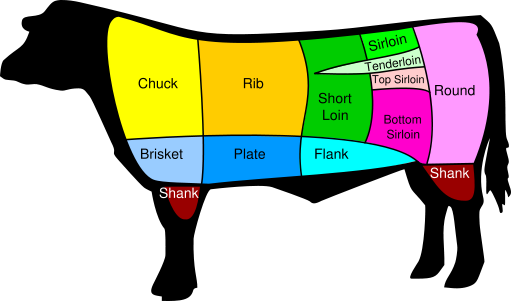 See the area that’s marked “chuck” – a lot of tough pieces of meat come from the chuck area of a cow but there’s a little gem embedded in there called a flat iron steak. 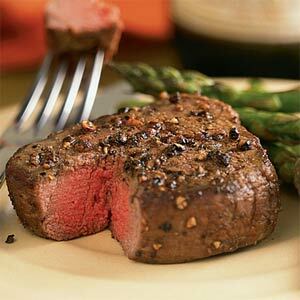 It’s just as tender as a filet at a fraction of the cost. So while the editors of Saveur might be able to tote home a tenderloin from the grocer without thinking twice, the next time you’re in the mood (or moo) for steak, pick up a flat iron. That ole’ Benjamin Franklin had it right. A penny saved is a penny earned.